Fredericksburg Farms sauces are amazing! 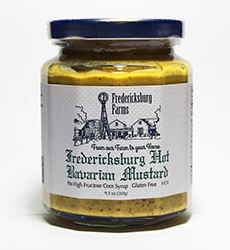 Fredericksburg Farms makes a variety of bbq sauces, mixes, rubs, mustards, hot sauce, salsas and many other condiments. Lochte Feed carries a great selection of all of these including Galveston Bay Cocktail Sauce, Sweet & Spicy Honey Mustard and Fredericksburg Hot Bavarian Mustard. Make your next dish come alive with these great flavors. Lochte Feed and General Store is so much more than feed store. We carry unique items that are locally inspired. Shop local at our location in Fredericksburg, TX and support local businesses that offer unique items perfect for gifts or your next event. This entry was posted on Sunday, June 19th, 2016 at 4:20 pm	and is filed under News & Updates. You can follow any responses to this entry through the RSS 2.0 feed. Both comments and pings are currently closed.